I thought these were just ok. They didn't have much flavor. 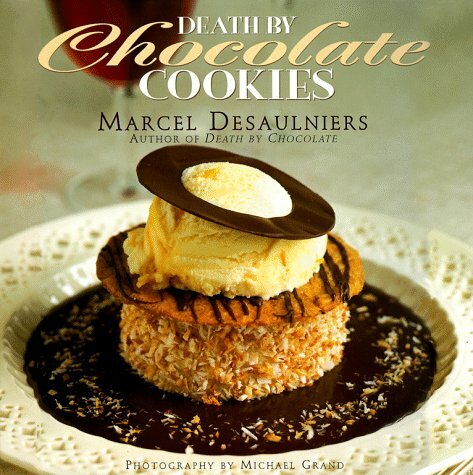 Marcel Desaulniers, the prize-winning, bestselling author of such classics as Death by Chocolate, The Burger Meisters, and Desserts To Die For, continues down the decadent road he has paved with sweets, turning his attention to one of America's favorite temptations: cookies. With his customary wit and clarity of style, Desaulniers has taken cookies to new heights in this stunning collection of seventy-five easy-to-follow recipes, each of which is captured in full-color splendor. Pared-down preparations, concise instructions, and satisfying results make the chocolate indulgences offered in this book the perfect antidote for anyone who has ever considered baking "work." No one will be able to withstand the temptation of these chocolate cookie combinations, from the simple and delightful Chocolate Peanut Butter Bengal Cookies or Chocolate Raspberry "Cookiecupcakes," to the intricate and impressive Golden Spider Webs with Wicked Ganache and Raspberry Rapture and Chocolate Balloon Cups with Oven-Roasted Pears. Desaulniers also lets us in on some old family recipes; Hessie Rae's Chocolate Pecan Tart Cookies and Mrs. D's Chocolate Chip Cookies make you wonder what other undivulged secrets he's been saving. As Desaulniers writes in his introduction, "Rather than showcasing towering confections like those in Death by Chocolate and Desserts To Die For, this is a collection of chocolate cookies, bars, brownies, nougat, brittle, praline, ice-cream sandwiches, candies, and biscuits that you can hold in your hand and pop in your mouth. O.K., so I went overboard and pulled out the plate in the chapter 'More Than a Mouthful.' But as Mae West said, 'Too much of a good thing is wonderful.'"